“A beautiful citizen uprising!” Apparently, that’s what I said — and there’s video to prove it. One of the most excellent regional unconferences (imo) is Transparency Camp, put on by the Sunlight Foundation. This year, I was interviewed as one of the participants, and my few moments of fame open and close the video. For those of you who’ve ever experienced micro-management by a board (on either side of the table), here’s a potentially helpful document I wrote. It’s designed to help nonprofit organizations reduce unnecessary board intrusion, concurrently while helping the ED and staff serve the board and provide them what they need to do their strategic work. See, I’ve served on two boards of late. And, educational experiences they have both been! I’ve learned through some rather twisted and uncomfortable ways about the roles of the executive committee, the board president, the committees, the executive director (ED) and the staff. I have not always been the easiest of board members to have around. I want information. I find it impossible to do my job of providing, among other things, strategic direction to an organization about which I know little. In my frustration, I became a whirlwind of data requests. I had culture clashes with the staff and ED about what information I had a right to see. Me? I think Google Analytics are relevant when one is the Communications Committee chair. And HTML newsletter open rates and clicks on links. Because I wasn’t receiving the information I felt I needed to do my job as a board member, and as my requests for information were often perceived of as stepping on staff and ED toes, the I-want-you-can’t-have push-pull became even more pronounced. Now, EDs have to protect their staff from excessive board requests and ensure that mission critical operations continue. 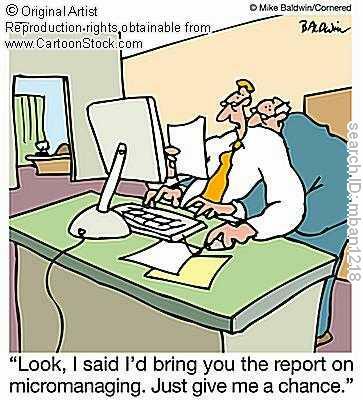 And usually, producing reports and providing information takes staff time that can impact the staff’s ability to do its work. So, what’s a sane organization to do? Well, I think the first thing is that people have to know is what they’re asking for and why … what purpose does the getting of the information provide? And what’s it worth? Is the information sought a $25 answer (a quick email sent), a $250 answer (perhaps a meeting with a few staff and follow up), or is it a $2,500 answer … perhaps a more extensive report? Board members should be able to ask a reasonable question of staff and get a reasonable answer. Equally, even without a master of science in management, board members need to understand “the cost” of their questions asked. So, what’s a sane organization to do? In my consulting work over the years (and in personal relationships), I see that it is my responsibility to ask for what I want and to make sure that I’m clear about what it is that I need as an answer/deliverable/date. My suspicion is that board member requests of staff would half and ED/staff resistance would subside tremendously if there were systems in place that required (forced) board members to be more thoughtful in what it is they need, and why. I’m all for the USPS cutting a day of delivery service to reduce expenses. Personally, I think for $.44, having a piece of mail picked up from my home and delivered straight to the door of any address in the U.S. has got to be the best bargain on the planet. So, if the Postal Service needs to trim a bit, ok, works for me. But why Saturday? Why not a weekday? Are we such an old-school bunch of thinkers to believe life happens M-F? Yeah, I get that M-F are classic biz and gov days of operation. So, what biz is going to actually falter if they can’t have USPS pick-up or delivery one day out of the week? Really. But it would be, imo, more harmful/disruptive/noticeable not to have delivery two days in a week: Saturday and Sunday. And, mercy, what about a gov holiday? What happens on President’s Day? No mail delivery for three days? I say cut Wednesday. Or maybe Thursday. But not Saturday. That’s a bureacrat’s answer. Think, people. Trends, trends, trends. Certainly not the first to spot this one. I just feel the cartoon-comic-drawn character approach to delivering marketing messages is firmly entrenched for now … and probably another 12-15 years before it starts to feel tired. Examples abound. I just happened to be very impressed by this one for a coffee service. Gosh, how much more fun must it be to be a salesperson for this company? I’d expect to see lots more of it … even, I’d bet, in government communications. Just watched a snippet of news on CNN. About the 150 or so ice fisherman who knowingly went into dangerous territory … anyway. Uh, this time, things didn’t work out, they needed emergency rescue, etc. The part I love-love-love about the story is the ever-so-irrate sherriff in the local area who is very upset about their irresponsibility and tying up emergency services and the cost to the county. Bratton told the Cleveland Plain Dealer that the fishermen displayed poor judgment in building a makeshift bridge to get from one section of the ice to the other. STOP EXPECTING THE GOVERNMENT TO PICK UP SLACK FOR YOUR IRRESPONSIBLE CHOICES. Really, that era of expectation and thoughtless, reckless choices that impact us all (that includes, by the way, one’s diet)… that era is O-V-E-R. I don’t normally type in all caps. You know that if you read my blogs at all. So feel my passion. Heed the warning. Straighten up and fly right. You are the only who command the ship called Y-O-U. Long, quirky and surprisingly charming. Reposting from Geren and Blather de la Semaine. A 42-minute long musical / movie: Dr. Horrible and his sing-along blog. I host a lot of parties. All kinds of parties. Cocktail parties. Living Locally parties. Geek parties. Picnic parties. Hula hooper parties. You name it. I find parties to be an excellent personal branding system and means to keep in touch with friends, particularly weak social ties: you know, people I like but just don’t see that often. Plus, parties are just way fun. Now, as more of my friends have elem and middle-school-aged kids, I’ve become more cognizant of their schedule pressures. So, I just switched up my parties, especially the cocktail parties, and made them kid-inclusive. Now, this is a very specific word choice I’m using. These are not kid-friendly parties. There’s no face-painting. There’s no kid-friendly food. And, frankly, there will be drinking and alcohol. I hope my adult friends will give stern looks to interrupting children who forget their manners. And I hope that, when we’re at a more upscale place, that the parents will take advantage of the teaching opportunity to discern appropriate clothing for different events. A cocktail party is a cocktail party. It’s not an outdoor picnic. The last 15-20 years of American culture — as I see it — have leaned toward parents and adults putting kids first and then socializing around the edges of their children’s activities. I understand this. I understand generational influences. I understand cultural shifts. And it’s all cool. I also believe that what has become the norm is now shifting and the kid-inclusive adult events, rather than the kid-focused family events, will start to become more common place and will shift the culture in a new direction. In either case, whether I’m right or wrong, this is how I’m doing it. My parties are kid-inclusive. But, please, parents, understand (and help your kids understand) the subtle nuanced differences of kid-friendly and kid-inclusive. I gave ’em 12-18 months. But my timing was a bit off. It’s less than a year since this post, and Border’s is clamoring for cash in the most discomforting of ways. Oi. I look at Border’s and their solution and way out of their mess is so clear to me. It’ll require different thinking and a different corporate culture to make it work, but their old thinking and old culture has already proven itself ineffective. So, gosh, given a choice, I’d pick a new culture and way of doing business over a collapsed business. But that’s me. I like fresh ideas that are logical, serving people’s needs and allowing businesses to succeed by being integrated in the functionality of their customers’ lives. The local Border’s where I live in Columbia hasn’t received many of my dollars in recent years. The appeal of being in an endless big-box store, crammed (over-crammed?) with merchandise has lost its appeal. Yet, I’ve been to the local Borders more times in the last month than I’ve been in the last few years. Why? I’m interested in co-working: that is, working with others in a productive and social space. Interestingly, for as large as my hometown is, I almost always run into someone I know there. I love it. I can work. I can have light interactions with weak social ties, and I feel included and connected to the human race when I’m out and about. Wednesday evenings host the knitting club at Border’s. The ladies, and they are all ladies, were chatty, happy and loud. I couldn’t help but overhear the conversation and announcement that Border’s was, in essence, cutting them off. “The Fire Marshal this … ” “The Fire Marshal that …” Essentially, their success as a group means they are beginning to outgrow the place. Their announcement to the group: We’re looking for a place that can hold us all, like an empty room in a school or church. Half the fun of getting out of the house and meeting up with friends to knit, cowork, study is being out. The chance encounters, running into friends I haven’t seen in ages, and striking up conversations with new people is why it’s worth going. Knitting in a school room? They’ll solve their problem right away, I’d bet. Their group numbers would plummet. So, there I was in Borders on knitting night. Every table was full, as is almost always the case, regardless of the evening. The adjacent magazine area was packed. It was a chatty, friendly and productive environment. Once again, I found myself irritated at Border’s lack of understanding the business model that will take them forward into the next decade or two of financial success: People want public spaces to be together. I decided to sleuth. I roamed the store and counted 57 people. This is a HUGE store in a grayfield of the suburban nightmare of one-story big-box stores spread over vast amounts of land. There were 63 people in the small bit of space in the cafe and magazine area. I’ve blogged about this before here and what I think the solutions for Border’s are, so kindly click the link and read on if you’re curious. Enough with businesses trying to do good with pink this, and red that and 10-percent-of-profits-go-to-X kind of overplayed, mediocre, boring corporate do-gooded-ness. It’s ineffective. It’s noise. It does little. Just watch what your customers are doing and pay attention to trends. All the answers are right there! Wouldn’t it be something if a slew of our elder citizens, those with more than enough money in their pockets, bank accounts and stashes, would demonstrate civic leadership and personal virtue by agreeing *not* to receive their Social Security checks. You know, to give the cash back. Come on. We know you’re out there. You made plenty of money buying property back in the day. Perhaps you inherited some highly successful stocks your mama bought decades ago. Maybe you just lived in an era when a blue-collar job was enough income to support your family, own a home, vacation here and there, and sock away some money for retirement. There’s a significant chunk of elder Social Security check recipients who will never have to pay for the low-cost (below-cost) natural resources they helped deplete: water, agricultural land, mineral resources and petroleum come to mind. There’s a number of SS check recipients who will never pay for the federal deficit that helped create a booming economy where they made their money in land, business or stocks. There’s a number of them that will receive pretty much endless health care when they paid a fraction into the system for what they get out of it. Maybe they could create a memorial wall, kinda like the stunning Vietnam Memorial in Washington, D.C.. Maybe they could create a special fund with the money to help less-fortunate elder-folk in their generation. Maybe, bless their souls, they’d direct those extra funds to the younger generations who will – have no doubt about it – pay for their generous access to and economically unsustainable costs of national debt and natural resources. Gee, that would be swell. OK, so I’m not in commercial real estate. Nor am I in retail. But I can pick up lots of micro clues and feel the trajectory of the accumulated data: I can see the direction something is going in, and I can usually tell how they can switch directions. So my suggestion here is going to require some future-think type of understanding to comprehend it. Border’s lost their specialness, coolness and newness. They are trying to sell too many things. They haven’t done much of anything new except bring in more things. There store is junky with too much signage and stuff trying to get people to buy. They’re struggling with the challenge of being so successful years back and spawning a lot of competition in their niche. Online booksellers and the secondary markets eBay and Amazon.com have provided many more options for avid book purchasers. OK, so maybe that wasn’t so short. People today desperately need space to work outside their homes, gather for book clubs, study together in groups, check their email, post some information on Facebook and so forth. Homes often don’t work for this type of gathering. Parents need productive space to do some after-work work, while sitting with kids doing their homework. First, get rid of about 60 percent of the books and 80 percent of the tchotchkes. Gone. Create two or more café areas with numerous, plentiful electric outlets and stellar, free wi-fi. Make one café the quiet zone in a quiet, back corner of the store. No cel phones. No group conversations above “library voices” allowed. Shhh. Make the other café social, a cel-phone-friendly zone, with lots of tables that are meant for collaborative work, book clubs, homeowner association meetings and study groups. Create a number of relatively sound-proofed rooms (with lots of windows to keep people civil) which groups can use for a specified and scheduled period of time. And before anyone uses such rooms, require a Borders’ Customer Agreement (with some fancy name). Much more to say on this but this blog post is getting long! Basically it would cover rules of engagement, civility issues, respect for Borders property (i.e. not eating while handling a magazine or new book!) and a direct and specific request that in exchange for this new community space, Borders’ customers use, when price-competitive, the borders.com website for purchasing new books. The bottom line: I believe that if Borders continues as it is, or only makes micro changes (such as a new store design), they’re going down. And hard. They have, at this moment in time, an opportunity to step into an entirely new relationship with their customers and the communities in which their stores are located. My belief is that with a genuine and direct explanation of why they are reducing in-store inventory to provide space for the community, they’ll increase customer loyalty and sales. I have more to say on all of this, but the main points are included in this post. I’ve lived in Howard County almost ten years, and have spent most of that time commuting to Bethesda. I now work out of my home. (I’m currently living in southeast Howard but soon moving to Ellicott City.) Working from home is convenient (I can just plop down on the couch with my laptop) but also simultaneously distracting and boring; as when I commuted to Montgomery County, I don’t really feel that connected with the community I live in.